Did you know that high blood pressure, or hypertension, doesn’t typically cause noticeable signs and symptoms? Hypertension is a common condition that affects millions of people. In fact, hypertension is the most common cardiovascular disease and is the leading cause of heart attack and stroke. But if you have it, you may not even realize it. You can check your blood pressure at home with a blood pressure monitor or have it checked by a medical professional at a doctor’s office or urgent care. You can learn more about blood pressure readings from the American Heart Association here. If you are experiencing any of these symptoms, call 911 immediately. If you are not experiencing any signs or symptoms but would like to have your blood pressure checked by a medical professional, come to FastMed Urgent Care. 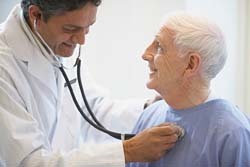 We can provide you with a blood pressure reading and discuss with you what your numbers mean. If your blood pressure is high, we can provide you with illness management for hypertension or refer you to a specialist for further treatment.